This year we’ve seen a lot of totally unlikely eyebrows, from foil brows to squiggle brows, and more — but lightning bolt eyebrow is the coolest approach to the fiercest beauty look because it can strike (literally) like a thunderstorm by just looking at your haters. 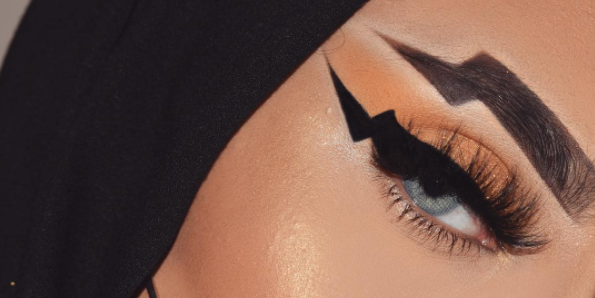 Makeup artist, Zakia Wahbi with Instagram handle @shinybeautiz pioneered the trend by shaping her brows into a lightning bolt, which she further teamed with a black lightning bolt eyeliner and bright orange glittery eyeshadow to create what she described as “#weirdo. While the second image has raked in more than 23,000 likes, users are also applauding the MUA for the artistic but weird beauty look — which means, prepare to see the lightning bolt eyebrow taking over your Instagram feed in no time. “Honestly love this look so much. It’s art!!! I never understand y people don’t say anything when you do some weird eye makeup but as soooon as you do something weird with your brows people go insane . I love it” an Instagram user wrote. “honestly….I love it,” wrote by another user.